We’re calling this The Best Brussels Sprouts Casserole for good reason. One bite of this cheesy brussels sprouts recipe and you’ll be hooked! Another thing I never used to be a big fan of is brussels sprouts. Also I’m confused, brussel sprouts casserole or brussels sprouts casserole? I see it spelled both ways and I’m not sure which one is correct so I’ll go with both versions. Brussels do sort of get a bad rap as far as vegetables go. Kids don’t usually like them and I’d say maybe 50/50 adults are going to say they like them or hate them. Used to be a hater. Now I’m a lover. We’ve certainly made a few recipes with sprouts on the site here that I do love. These Whiskey Glazed Baby Carrots and Brussels are one of them, another that we make all the time is this Asian Chicken and Brussels Stir Fry. If you’re looking for a cold brussels sprouts recipe, try this Thai Peanut Brussels Sprout Cole Slaw. A perfect side dish recipe or a sandwich topping! 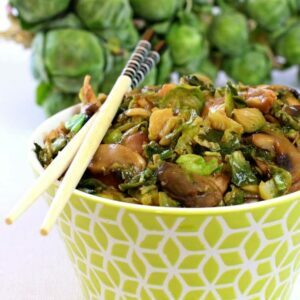 Or you can toss some brussles sprouts in our favorite Stir Fry Sauce and and make a stir fry recipe. That’s always going to be a hit at our house for dinner! I’m telling you, this oven roasted brussel sprouts recipe is one of the best things vegetable side dishes I’ve ever eaten. We also made this more than a few times to tweak the recipe and it was gobbled up every single time. We were even eating these sprouts for dinner, no main meal required. What’s not to love here anyway? Bacon, cream, cheese and crispy panko bread crumbs…you don’t even know you’re eating a big bowl full of vegetables here. 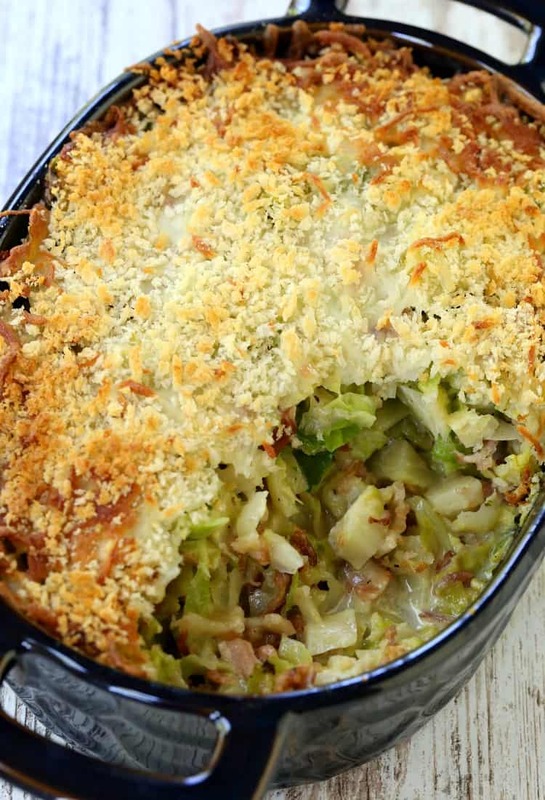 But there is a trick to making this The Best Brussels Sprouts Casserole THE BEST. The trick to making this recipe the best brussel sprouts recipe is all in the way the sprouts are cut. They are sliced into thin pieces, or shaved, so that you’re not biting into a big giant sprout. And of course bacon. Because an easy brussel sprouts recipe with bacon is always going to be a home run. I might not be as big of a fan if they were in my casserole in big old pieces. 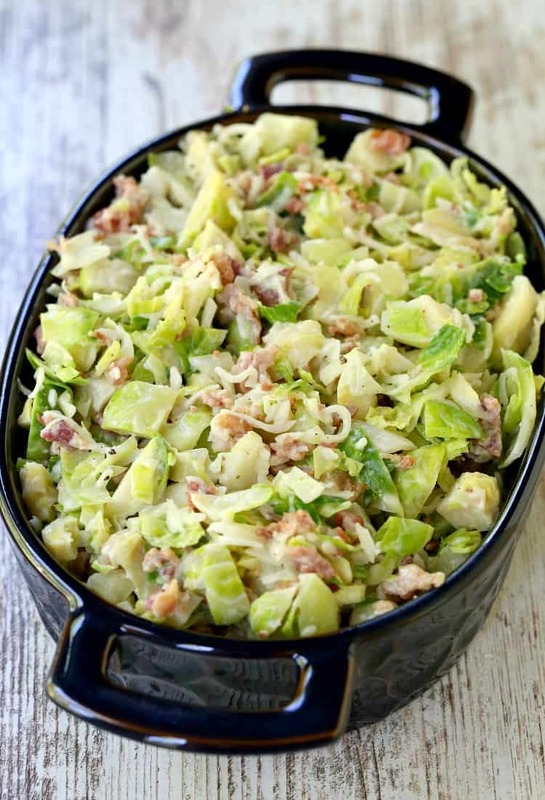 But the way these brussel sprouts recipe uses shaved sprouts mixed all together with the bacon and cream…you really can’t beat it. Next you mix those sprouts together with bacon bits (or crumbled bacon) cream and shredded cheese. Top it off with panko bread crumbs and bake. This brussel sprouts recipe can also be made ahead of time so there’s no last minute boiling of the sprouts or slicing like a mad person in the kitchen at the last minute. Just relax and do all that crazy prepping when no one is watching. Then you can act all casual when dinner is ready – you’ve got this. The Best Brussels Sprouts Casserole can be served up with chicken or a steak and watch it disappear. Even the kids are going to love this brussels sprouts recipe, promise. If I can say that I’m a huge fan, believe me. They will too. 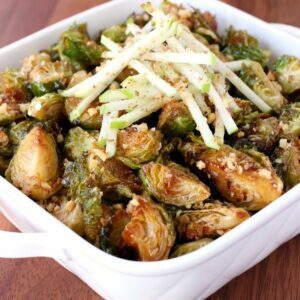 Try this easy brussels sprouts recipe for your holiday meal, or as a side dish to any dinner! 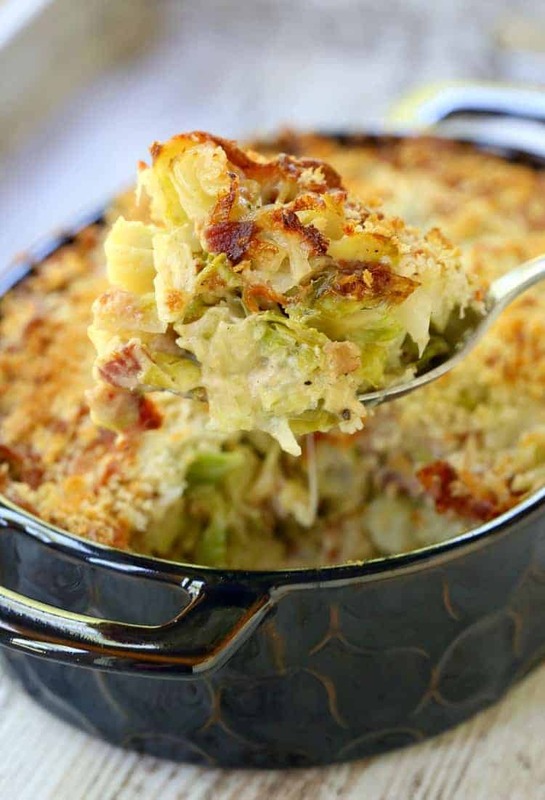 This cheesy, bacony, creamy brussels sprouts casserole is going to be your family favorite too! 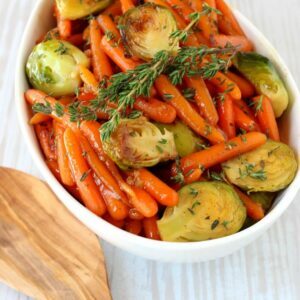 A tasty side dish that works with a holiday meal or everyday dinner! Trim the ends of the brussels sprouts, cut the sprouts in half, then add them to the water once it comes to a boil. Boil the sprouts for 7-8 minutes, until just tender. Drain and let cool. Slice the brussels into thin pieces then add to a large bowl. Mix together with 1 cup of the cheese, the cream, the bacon bits, salt and pepper. 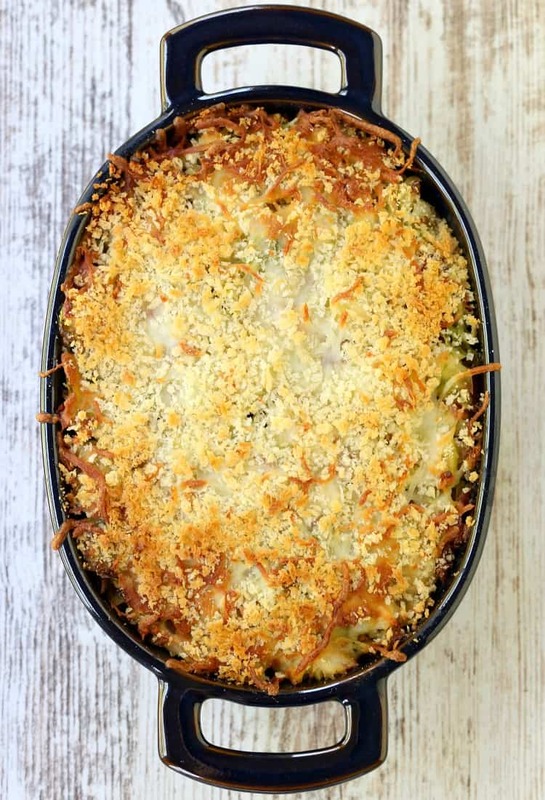 Pour into a 9 x 13 inch baking dish and cover with the remaining cup of cheese and the bread crumbs. Bake for 25 minutes until the casserole is bubbling and the bread crumbs are brown. You can try! It’s not a crock pot recipe but it’s worth a shot! Can you mix up the night before and refrigerate and then bake the next day? I’ve been looking for a recipe to make me like Brussels sprouts. This sounds good but I am vegetarian. How important is the bacon? Could I substitute something in lieu of the bacon? I”m always going to say that the bacon important…:) You could leave it out though and add some extra seasonings like smoked paprika maybe? I too Am a vegetarian. I made this recipe with plant based bacon. It won’t be as crisp as real bacon but it does the job! Perfect! I’m so glad to hear that you improvised instead of not trying the recipe! 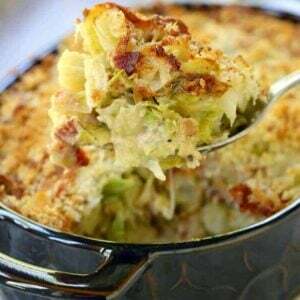 Do you think I could use frozen brussels sprouts for this recipe? Yes just defrost them first! I’d love the feedback, thank you! My mom told us she wants us to steer clear of our traditional side dishes for Thanksgiving this year. This recipe for the win! Can’t wait to make it! I have everything but cream. I do have sour cream and milk or evaporated milk and regular cheddar cheese. Will these ingredients work ??? If you have whole milk I’d say that’s ok. It will be a little thinner but if it’s anything less than whole milk I’d use the evaporated milk instead. And the regular cheddar cheese will work just fine! Yum! A big hit at family thanksgiving today. I used a 1/2 cup light cream & 1/2 cup sour cream along with cheese & bacon. I put the che se on top, added French fried onions instead of panko. Sounds amazing! thanks for checking in Matthew! Properly, it’s Brussels (as in Brussels, Belgium) sprouts. I made this for Thanksgiving and it was a big hit. Making it again for Christmas Eve dinner. My nephew saud definitely yes bring it!! I doubled the ingredients except the sprouts, used a pound of bacon because it’s bacon and it was fine. I do Keto so I used crushed pork rinds. Funny thing is…I thought I didn’t like Brussels sprouts!! Yep there was a time I didn’t think I liked them either! And the more bacon the better!